Belvidere North High School's Ben Kunsak (right) grapples with Jefferson's Vernell Johnson during his 6-2 win in the 145 pound class during the Sycamore Regional wrestling meet on Saturday, February 2. Kunsak went on to win second place at the meet. 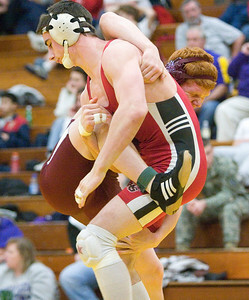 Regional finals: Belvidere's Nick Finkenbinder defeats Jacobs' Dan Olsen (yellow) 152# 6-0. 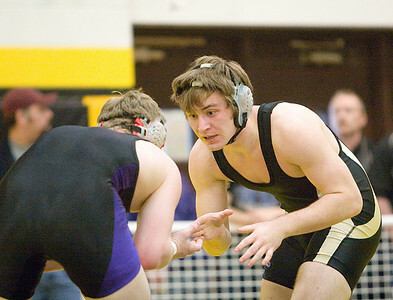 Fickelbinder finished first in his weight class in the event, Steve Willis also placed first at the 125 pound class, and Harrison Ford finished in first place in the 275 pound class. Sycamore's Jake Lancaster defeats Belvidere's Travis Weinsheim in a fall. 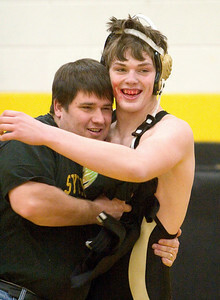 After the match he was congratulated by Sycamore wrestling coach Brian Davis.